Off centre category: Delivered on-site/client premises. 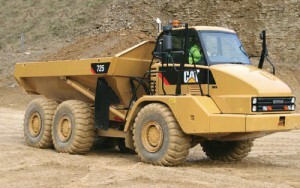 This course provides instruction in correct operation of the Dump Truck Rigid chassis for operators who will be using such machines on site. It provides training as referred to in the laws relating to work equipment and health and safety, and is accredited by the Construction Plant Competence Scheme (CPCS). • Describe the nature of the sector of industry and their role and responsibilities as a plant operator. • Name and explain the purpose of the principal components, the basic construction, controls and terminology. • Conform with manufacturer’s requirements, as per the operator’s handbook, including additional information and relevant regulations and legislation. • Undertake all pre–use checks. • Configure and have ready for travel (site and highway). • Travel over rough, undulating ground, steep inclines and level surfaces – both loaded and unloaded. • Manoeuvre in confined spaces whilst carrying loads. • Ensure the suitability of the tipping and loading area. • Explain action required for hazards, underground and overhead services. • Position the vehicle to receive loads. • Comply with loading procedures. • Ensure load integrity and security. • Transfer loads to different locations. • Discharge loads into trenches and over edges. • Maintain a safe and tidy working area. • Carry out shut down and securing procedures. • Explain the loading and unloading procedures for machine transporting.